Everybody loves to receive promotional gifts, but these advertising calculator rulers can leave an effective impact with a customised corporate product that's more likely to be used long term. Calculate your profits with these promotional freebies. Be sure to catch the eye of clients and potential customers with a large 50 x 20 logo branded print area on the surface of the calculator ruler. This multi-purpose 30cm ruler features 16 time zones, calculator, snooze control, countdown function and a euro calculator. So why not give them away to your customers and have your company details on someone elses desk? 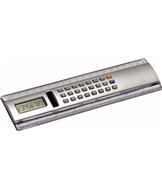 Order your Calculator ruler with logo by completing the contact form and we'll get straight back to you.